IKEA has a special kind of attraction - cheap, cheap, cheapness! Not only is all the furniture and decor cheap, but they have a little cafe that also serves inexpensive food. 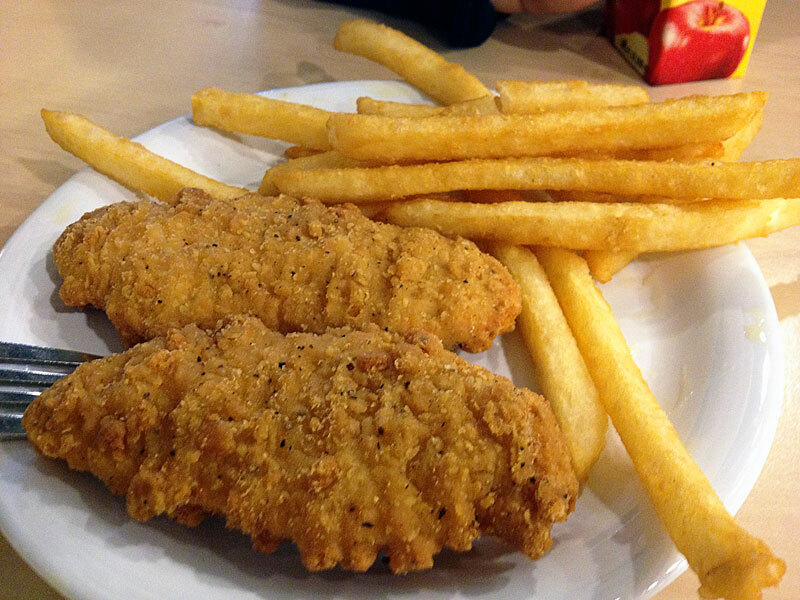 We ordered the chicken strips and fries for Kirsten's son, and they were pretty much about what you would expect for cheap chicken and fries - the fries crispy and a nice thickness. The breading on the chicken was pretty thick and covered all chicken flavor you might get. The chicken was a little dry and nothing great, but for a two-year-old, it wasn't too bad. 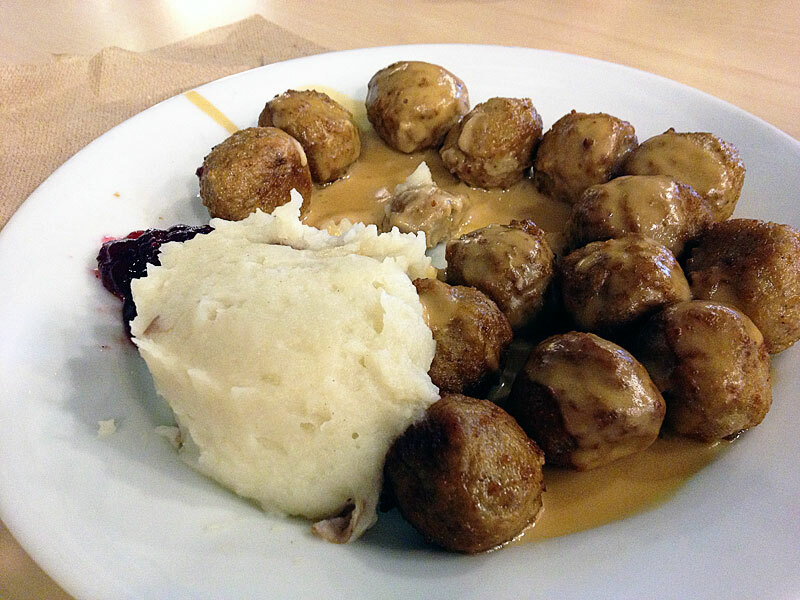 The meatball plate is the iconic IKEA dish, served with mashed potatoes and jellied lingonberries, which basically taste like cranberries. Though it was a good amount of food for the price, the food was not really the best. The meatball was too small and a bit dry, and the potatoes were a little too sticky and gluey for me. The little drop of lingonberries was almost laughably small, but at least there was enough gravy for all of the meatballs to give it enough flavor. What You Should Do: If you are at IKEA and forgot to have lunch, you won't be incredibly disappointed if you stop by their cafe for a quick lunch. They have a few healthy options like salads (though I was stray away from scary-looking smoked salmon....) and everything is really inexpensive. Is it fabulous cuisine? No. Would I come here just for the food? No. But will you get fed for a low price and quick service? Yes. Just wanted to give you a little shout-out---we love this blog! We moved to the area a year ago from Texas, and we were excited about all the new fun places to eat around here, but we have two littles and didn't want to spend our precious date nights trying restaurants we'd never heard of. Your reviews are detailed, my husband LOVES being able to see pictures of what the food will look like, and so far we've found your information is accurate and unbiased. We use your posts almost every time we go out. Thanks so much!! I've had really mixed experiences at IKEA's cafe. Sometimes the food is great (especially for the price), other times it is gross, slimy, and cold. Ikea food does tend to be hit or miss. For the most part though I love the meatballs, and you can always ask for more lingonberries. My girls love the princess cake for dessert. Though they re-named it last time we were there, so I don't know what it is called now. I really want to go eat there now!